Flight of the Butterflies is the awe-inspiring story of two unlikely heroes that share a common strength. Based on true events, it follows the epic journey of the iconic monarch butterfly in one of the most incredible migrations on Earth, and the determined scientist, Dr. Fred Urquhart, who spent 40 years trying to discover the mysteries surrounding their journey and secret winter hideaway. 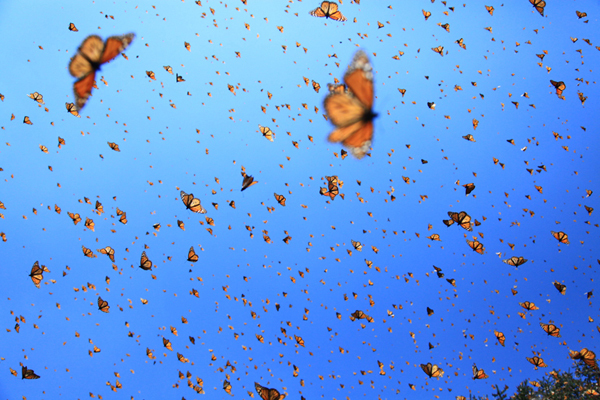 In 2008, UNESCO declared the monarch butterfly reserve in Mexico a World Heritage Site. Monarch butterflies depend on milkweed and milkweed habitats for survival. Despite efforts by the Mexican government to protect the sanctuaries, enforcement is difficult in remote regions and several forces persist in threatening the survival of the monarch butterfly migration, including degradations of forest habitats, the side effects of industrial farming and climate change. SK Films will donate significant portions of the film’s box office revenue toward Monarch butterfly conservation through Mexico’s leading conservation organization, Fondo Mexicano para la Conservación de la Naturaleza. Flight of the Butterflies will show daily in the IMAX® Theatre at Fernbank Museum of Natural History from January 4 through May 9, 2013. Alaska: Spirit of the Wild will also show daily beginning January 4. IMAX tickets are $13 for adults, $12 for students/seniors, $11 for children ages 12 and under, and $8 for Museum members. Value pass combo tickets are also available ($19-$23), and include admission to an IMAX film and the Museum. Fernbank Museum of Natural History is located at 767 Clifton Road, NE in Atlanta. For more information on the film, visit flightofthebutterflies.com. For visitor information and tickets, visit fernbankmuseum.org or call 404.929.6300.